Have you ever tried putting root beer in chocolate cake? Because it's good. Like really good. We've made these before, for my brother's first day of school last year. I thought, "Oh maybe these will be good. I like root beer." The cake is chocolate, light and fluffy, with a hint of root beer due to the root beer and root beer concentrate in it. You might be thinking, "Root beer concentrate???" At least that's what I thought when I saw this recipe. Maybe you know all about it. But I went on a huge odyssey to find some. I tried a bunch of different stores and finally ended up finding it in the extract section of Kroger. So then the cake has a root beer frosting filling, and it's all topped with vanilla frosting. And then, if you feel like it, you can drizzle some chocolate sauce on top. Because a little chocolate's never hurt anything. Even if you are not a huge root beer drinker, you'll find it hard to not like these. Really. I'm not just saying that. I promise. In the bowl of an electric mixer, cream butter until smooth. 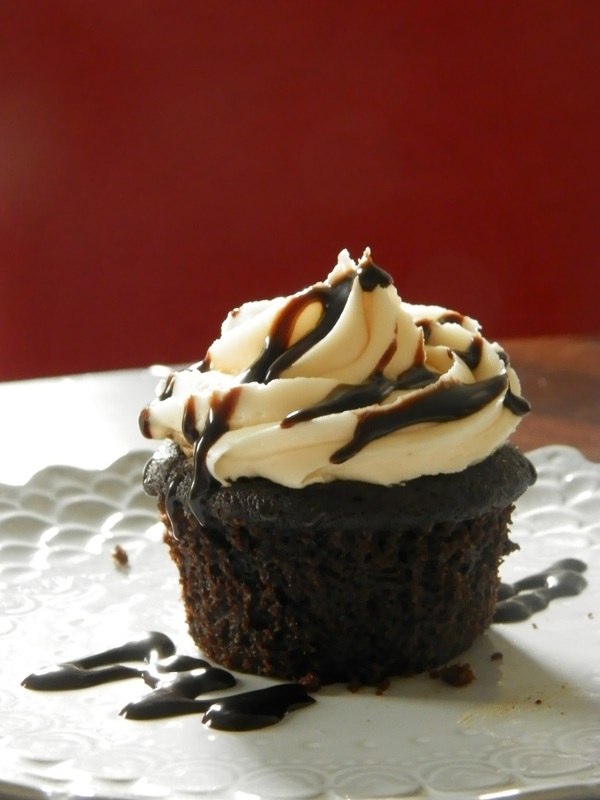 On low speed, add powdered sugar one cup at a time, increasing speed to bring the frosting together. Add milk and vanilla extract. Beat until smooth. 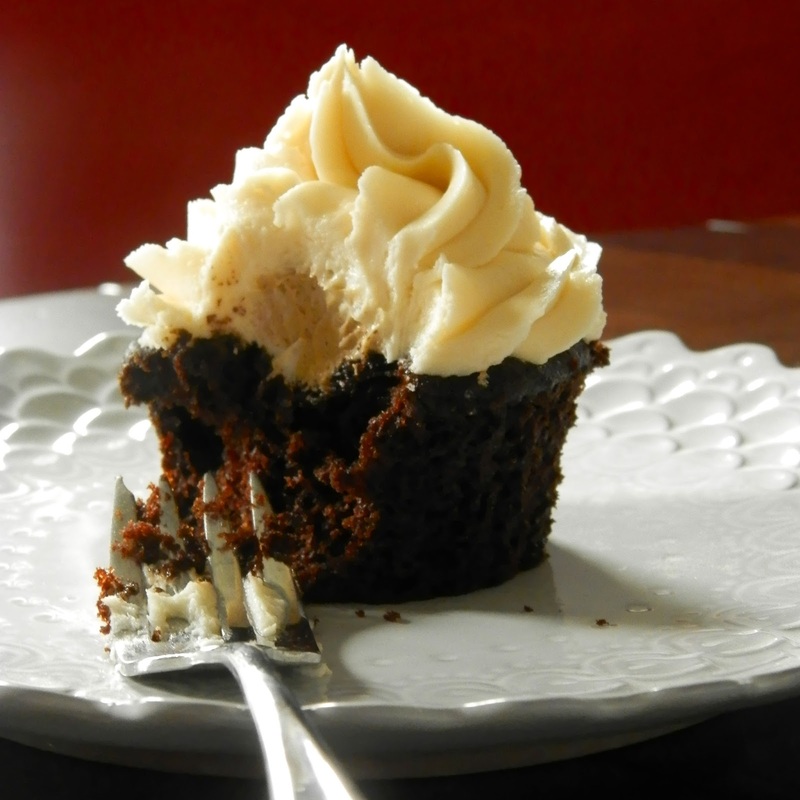 Remove almost all of the vanilla frosting, leaving behind about 1/3-1/2 cup in the mixer. Set vanilla frosting aside. Add root beer extract to remaining frosting in the bowl and beat until it comes together. Prep two pastry bags (or you can simply use spoons) and fill one with vanilla frosting and the other with root beer frosting. 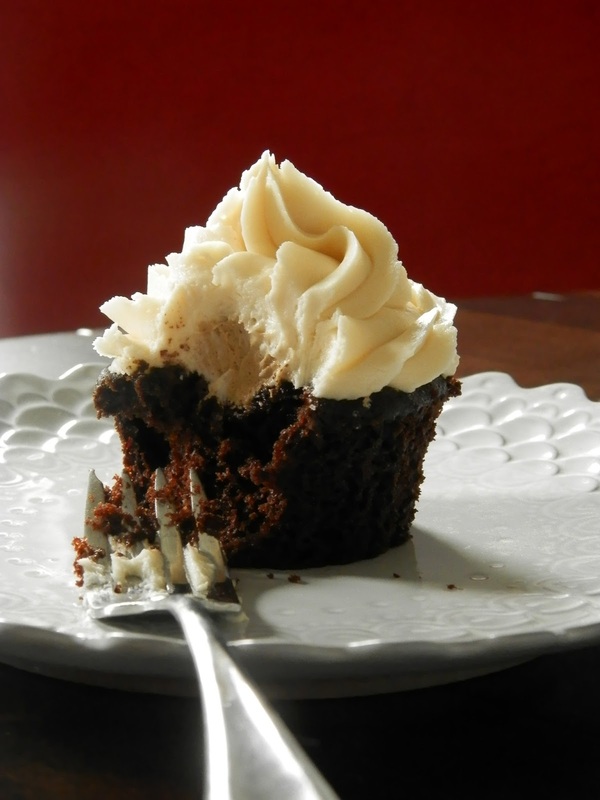 Once the cupcakes have completely cooled, fill each one with root beer frosting (I simply plunge the pastry tip into the cupcake and squeeze), then top with vanilla frosting. Finish with hot fudge and a cherry on top! How many does one recipe make? A friend of mine and I are going to try making these tonight! We've been planning this day for a while! Oh Molly! :( These cupcakes really flopped for us! We made the recipe per the instructions, with the exception of that I always try to cream butter and sugar together for cakes and cookies. They overflowed their cups while baking and spread out over the whole muffin pan top. When we tried to remove them, they were oily as HECK in the bottom. Are we certain that an entire 1/2 cup of butter goes into the recipe with one 1 1/8 cups flour? Don't get us wrong, they tasted delish, you know, all crumbled apart and piled into a bowl with a little vanilla ice cream. :) And it was a GREAT idea for put root beer and chocolate together, but I think next time I'm going to stick with my tried and true chocolate cake recipe, substituting root beer for the coffee and adding a bit of the root beer concentrate. I am so sorry to hear that! Yes, 1/2 cup of butter is what we've always used and we haven't had any problems with it. Solid butter and melted butter behave very differently, so creaming melted butter would not have the same results as creaming room temperature butter. It may seem like a small change, but it's amazing what a difference the temperature of butter can make! I have ruined entire batches of cookies by using slightly over-microwaved softened butter rather than patiently letting it come to room temperature on its own... I am glad that you were able to enjoy the recipe nonetheless, and I wish you better luck next time should you ever choose to try again!